If you’d like to also be SEO’d, contact my webmaster paj@webondb.com Thanks, Paul. I owe you much to your education & inspiration for online business matters. Due to these rankings, in just the 1st Quarter of 2011, we have already set new records that we achieved just last year! Our client demographic has altered to a 45-50 year old successful businessman who does not want, & does not know how to do this type of research. Keyword: “German Genealogist” Website Rank Monitoring Service. And, we have now found, in less time, more ancestors in more villages than ever! To new clients, we offer an initial whopping 50% discount for your initial online research retainer. 10% for in-country records research. Your personal check is welcomed. Email your images, but Mail your data, documents & dollars to 410 S Saddle St; Gilbert, AZ 85233-6810 USA < The latest client, a former director, Deutsche Bank, recently wrote our 58th endearing endorsement on Linkedin.com! In 2008, my webmaster also encouraged that I register there. The kudos were only from folks who happen to be on Linkedin! They are from clients, coaches & colleagues. Caveat: Past performance is no guarantee of future results. That said, we have a 99% success ratio in finding data, documents & images that our clients did not have in a digital format. 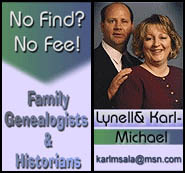 Engelhard(t) German Genealogy case cracked back 3 generations & 3 locations in Baden & Wuerttemberg!